Seattle Seahawks head coach Pete Carroll, left, shakes hands with New England Patriots head coach Bill Belichick before the NFL Super Bowl XLIX football game Sunday in Glendale, Ariz.
Everyone knew it was coming. Second-and-1 on the 1-yard line. Marshawn Lynch was waiting in the backfield, poised to do what he was put on this Earth to do: Get a touchdown — this touchdown. The football gods had telegraphed how they wanted the game to end, directing a floating ball straight into Jermaine Kearse’s hands. Beast Mode was going to drag the New England team kicking and screaming into the end zone if he had to. But the play call came in, Russell Wilson attempted a doomed pass that Malcolm Butler intercepted, and it was Seattle that punched and screamed its way off the field. The Web erupted in outrage that Beast Mode never got his moment. For Seahawks fans, calling a pass was essentially Pete Carroll denying his team’s fate. For many others, it seemed like an inexplicable miscue. “Pete Carroll botches the Super Bowl,” wrote Ian O’Connor, simply stating what most people were thinking. These are gaudy numbers. Lynch is clearly an unstoppable force going up against an extremely moveable object. Why wouldn’t Carroll give him the ball? First, some amount of passing is, at least theoretically, probably necessary. It’s unlikely that the optimal strategy is to run 100 percent of the time because if a team did that, the opponent would adjust accordingly. But for the purposes of this analysis, I’m going to assume that, for any given play from the 1-yard line, running was Seattle’s best option. An NFL head coach’s goal isn’t to maximize his team’s chances of scoring a touchdown on a given play; it’s to maximize its chances of winning the game. That distinction seems to have gotten lost in all the rancor and rush to condemn Carroll. Defiant! Basically, he thought the Seahawks were going to score regardless, so he was willing to waste a play on a pass. If they scored, fine. But if they didn’t, at least they would’ve run a few seconds off the clock. Sounds crazy, but he’s right: With 26 seconds left and only one timeout, the Seahawks couldn’t run Lynch three times in a row. If they rushed on second down, didn’t make it in, called timeout, rushed again, and still didn’t make it in, they’d probably be out of time before they could get off another play. 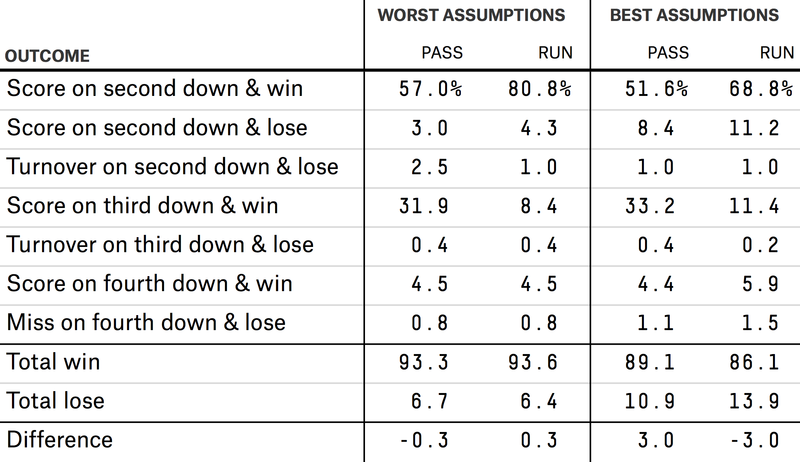 So, the Seahawks had three downs to work with, but they could only run Lynch twice at most. Thus the question isn’t whether the Seahawks should’ve called a run — we’ve already stipulated that. The question is when they should’ve called a run. And this is where the logic of those Harvard tweets undoes itself. If Lynch were a sure thing, the Seahawks definitely wouldn’t run on second down. They’d want to run time off the clock. The scenario would be the same as when a team can win with a short field goal. Because the field goal is a sure thing, the team is willing to wait. But as great as Lynch is, he isn’t the same a kicker attempting a 20-yard field goal. For this analysis, I’m going to assume he’s about 80 percent. If that sounds high or low, it doesn’t really matter: It’s not the most important factor in the calculation. The most important thing is the odds of the Patriots coming back to win if the Seahawks score too quickly. AFA’s model may broadly underestimate the ability of modern kickers. Even if it is generally right relative to the league today, it is still calibrated to the average NFL kicker, whereas Patriots kicker Stephen Gostkowski is one of the best long-range kickers in the league. Over his career, he has made 14 of 18 kicks from over 50 yards (78 percent), including eight of nine in the past three years. The Patriots’ offense is not typical. It’s Tom Brady’s. Brady eats pieces of game-winning drives for breakfast. Let’s spot the Pats some yards, then, and assume the Patriots win1 about as often as a typical team in the AFA model would2 if they started on the 40-yard line. That would give them a 14 percent chance. Maybe that’s generous, but we’re looking for an upper bound. A secondary factor, noted by Brian Burke of AFA, is that stopping the clock by passing on second down also forces the defense to defend both the pass and run on third down (because the Seahawks still had a timeout). That would make Carroll’s decision better, so I’ll give him a 5 percent bonus in the “pro-passing” scenario and none in the pro-run scenario. The main objection to this thinking seems to be: “But the risk of throwing an interception was too great.” As evidenced by, you know, the fact that Wilson threw an interception. #NFL teams this season threw 66 TD passes with 1 INT on passes from the 1-yard line. That 1 INT was … well … tonight. That’s right. On the 1-yard line, QBs threw 66 touchdowns with no interceptions prior to Wilson’s errant toss.3 Not mentioned: They also scored four touchdowns on scrambles (which Wilson is pretty good at last I checked). That’s a 60.9 percent success rate. But the Seahawks don’t have an average rusher; they have Beast Mode. As I said, we’re stipulating that he’s way more likely to score than a pass is, so his exact number doesn’t matter very much for our calculations. It does matter that he isn’t particularly fumble-prone — but he has still fumbled about 1 percent of the time in his career, which means passing carries an extra 1 percentage point of risk. On the other hand, due to the peculiar scenario, it behooves a QB to play extremely carefully. Throwing an incomplete pass only moves the needle a tiny bit, whereas throwing an interception is devastating. Thus a coach might believe that his QB will throw a pick even less often than normal. So, we’ll try favorable and unfavorable assumptions about that as well. This isn’t about passions, and it isn’t about statistical mumbo-jumbo. It’s about arithmetic. Under the most pro-Beast set of assumptions, rushing may have been the better play but by the slimmest of margins (0.3 percentage points). Under a more pro-Gostkowski set of assumptions, passing may have been the best play by up to 3 percentage points. But we’re still discussing marginal improvements in odds. Pick which assumptions you like; it doesn’t really matter. Carroll’s decision wasn’t the epically bad call many have made it out to be. Meanwhile, the coach on the other sideline had a mildly controversial call that history will forget because A) it was more than one play before the decisive play (people tend to have a short memory for these things), and B) the Patriots won, so who cares. After Lynch ran 4 yards to set up second-and-goal at the 1, most people expected the Patriots to call a timeout. After all, there was a million percent chance that Beast Mode was going to score, so why not save as much time on the clock as possible? Yet the Pats let the clock run, as if head coach Bill Belichick psychically knew the Seahawks would muck it up. Of course, normally, the leading team wants to shorten the game to give its opponent the fewest number of opportunities to catch up as possible. In this case, however, the Seahawks were going to get three shots at the end zone regardless. That isn’t to say there is no benefit to letting the clock wind down. As already discussed, leaving only 26 seconds doesn’t leave Seattle enough time to attempt three rushes (which we’re stipulating are better plays for them). Seattle turns the ball over on either second or third down. Letting the clock run slightly increases the chances of this, assuming the odds of a turnover are higher on a pass than a run (we’ll take it as about 2.5 percent combined instead of 2 percent). Seattle fails to score on all three plays. Again, leaving the Seahawks a little less time probably increases the chances of this happening because it forces them to pass at least once. And we’ve seen how that worked out. Seattle scores. New England gets the ball back and then goes on to win the game (most likely by kicking a field goal and then winning in overtime). But winning erases all sins. This season’s goal-line interception rate is fairly low though. Since 2001, on second-and-1s on the goal line, quarterbacks have thrown interceptions on about 2 percent of passes. And that’s not even counting the possibility that the Patriots may have avoided this whole situation if they had intentionally missed the extra point one drive earlier, therefore not encouraging the Seahawks to go for a touchdown.